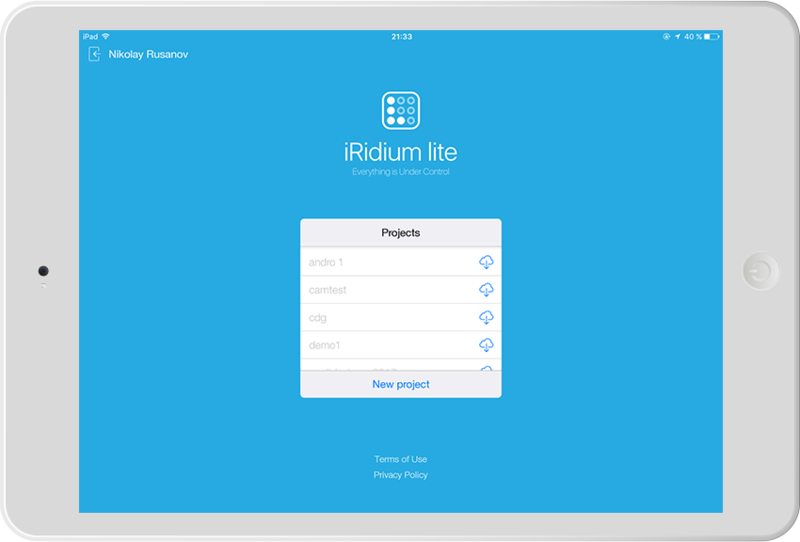 On April 7 we announce the release of a new software product for home automation systems – iRidium lite. 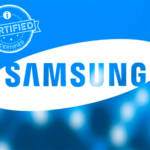 It claims to lead in the field of multiprotocol applications for Connected Home (or Smart Home) systems of professional installation. It acts in some other segments, as well. 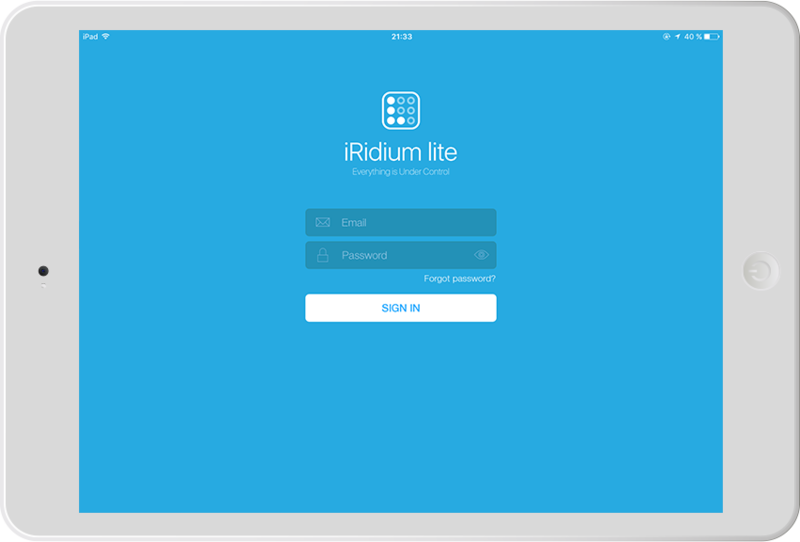 iRidium lite application, as well as other products by the company, is intended for installers of home / building automation systems and system integrators. In this article I will try to describe the capabilities of the new product in detail and its differences from other applications of the company. – capability to customize a visual interface and logics from the application itself without external editors. A control system is laid already on the design stage of this kind of sites. Let’s suppose that lighting and room thermostats are controlled by some KNX bus devices, the boiler and the ventilation work using the Modbus protocol, air conditioners are connected via the Coolmaster controller, the color lights to the music in the entertainment room are Philips HUE, Mobotix door entry is used, Kramer HDMI matrix switch, Apple TV And Kodi are used as video sources, a projector is installed with a PJLink protocol and a TV is controlled via Global Caché IP2IR converter. If the customer does not want to spend time or pay for the development / configuration of the individual interface, i3 lite with a central controller is perfect. 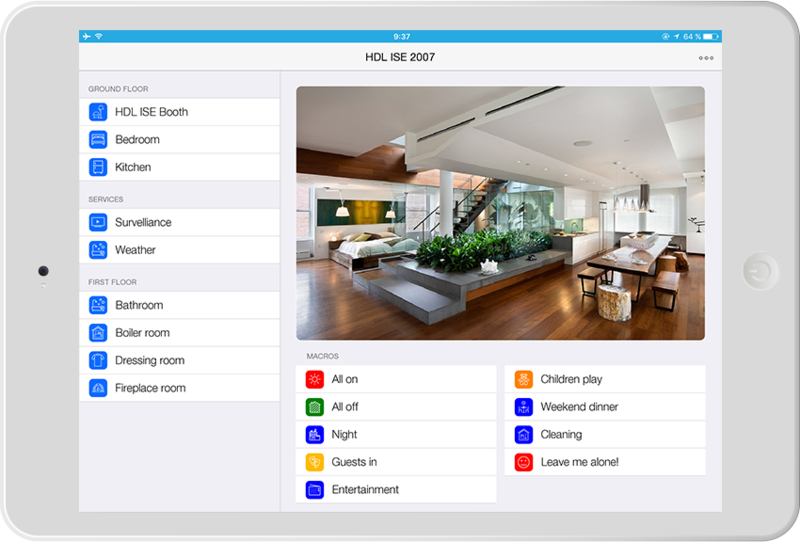 The integrator creates a configuration of rooms, adds devices and sets them the right way. The application will automatically configure iRidium server so that logics and schedules work round the clock. Usually fixed control panels are installed on such an object. In the future they are supplemented with personal gadgets of the customer. The application automatically adapts the project when it loaded on tablets or smart phones. After a project is completed, an integrator buys a license for the object and adds a end-user’s account to the list of its users. In the future a user enters their data and password when installing the i3 lite application on a new mobile device and the control project is immediately downloaded on the smart phone or tablet. A one-page remote control is usually required for a home theater. Curtains and lighting are controlled via Fibaro hub, Kramer matrix, a PJLink projector, the rest via IR through Global Caché iFlex. The cost of the license for an end-user for one object is 150 USD. 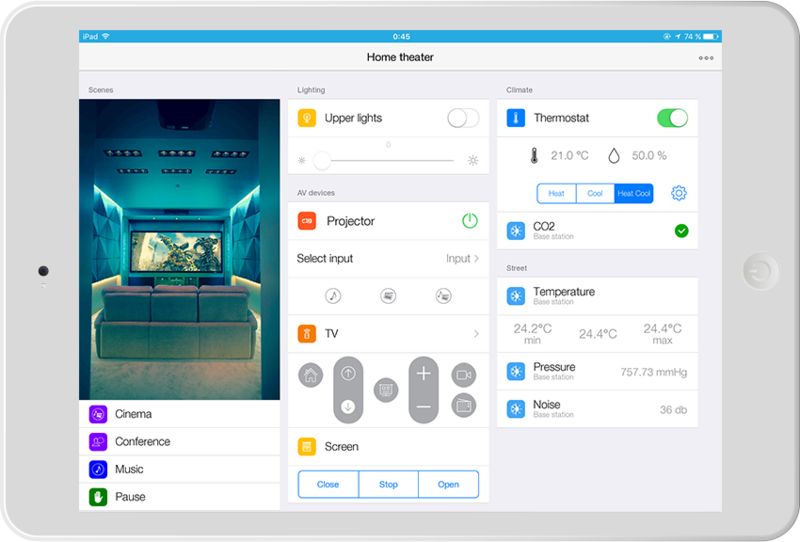 Such a project typically features HDL lighting and climate control system, Netatmo weather station and a client might use a robot vacuum cleaner, an air conditioner and a dishwasher of Samsung Smarthome product line. 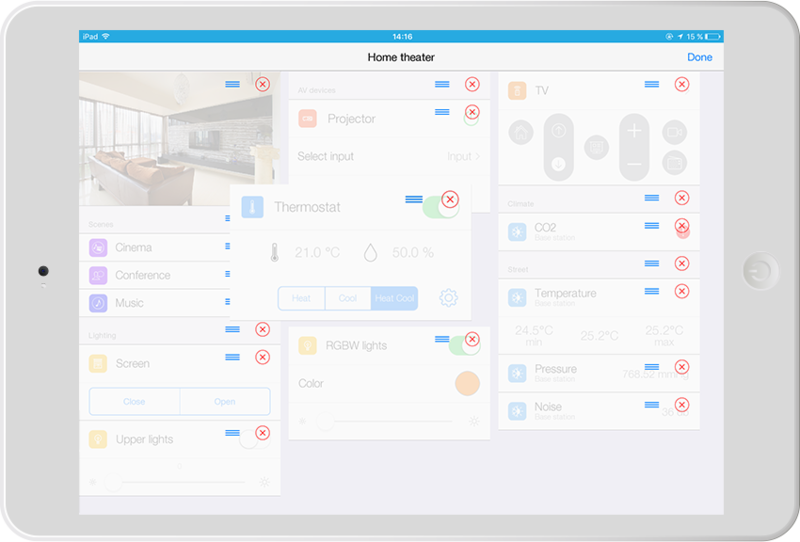 The client wants to manage his Smart home from two tablets, one computer and three smart phones. Schedules are also required, and the client wants to edit existing schedules and create new ones. He is not ready for big expenses. i3 lite is used with the iRidium server installed on Raspberry Pi 3, the cost is 70 USD in assembly with the power supply. One time cost of a license for an end-user for an object is about 300 USD. The task is to give inhabitants of apartments an opportunity to open barriers in the yard from their smart phones and to have access to video streams of cameras in the same yards. To control the barriers, a Modbus TCP controller is used. The controller is assigned an open external IP address. iRidium store already has a universal module for the ModBus TCP protocol and a camera module. The process of creating the right project for a particular house takes several minutes. Next the project is assigned a unique login and password, to which the license is activated. 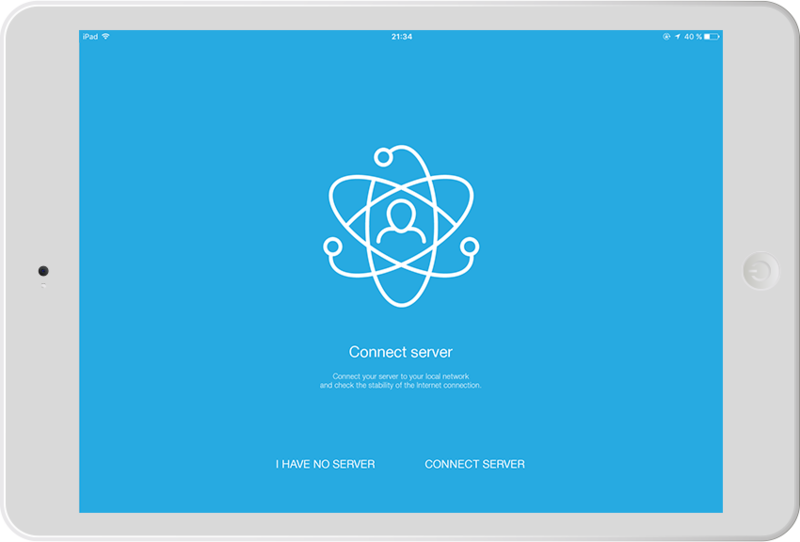 Any resident of the house downloads the i3 lite application, enters the login and password for his home once, and then receives the functions provided by the management company. The cost of the license is paid once by the management company: 150 USD for the whole house (not important, 10 apartments, 1000 apartments or 200 private houses in the village). Let’s stress once again it is an application for professionals who develop projects and sell the results to an end-user, after installing an automation system on the object. To create and edit a project, you need an iRidium dealer account. After logging in the app a list of available projects is seen and new projects can be created. The created configurations can be saved in the cloud. The list shows which ones are already downloaded on the device and which are not. 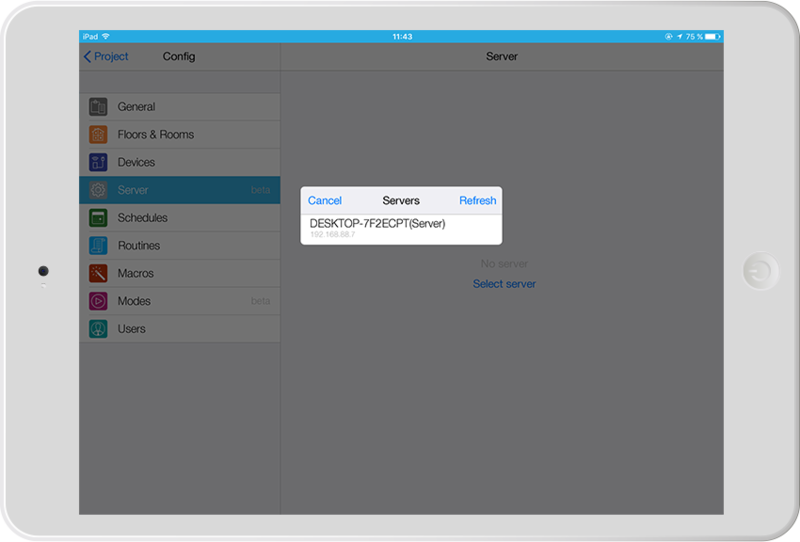 When creating a new project, you can select a mode – with or without a server. The central controller, if present in the system, is used for rules, schedules and remote access via the Internet. It also provides better quality feedback from devices, especially if a large number of panels / gadgets are used. The controller can be added any time later. After creating a new project, we get to the configuration section. The application offers to add a standard set of rooms or add each room manually. 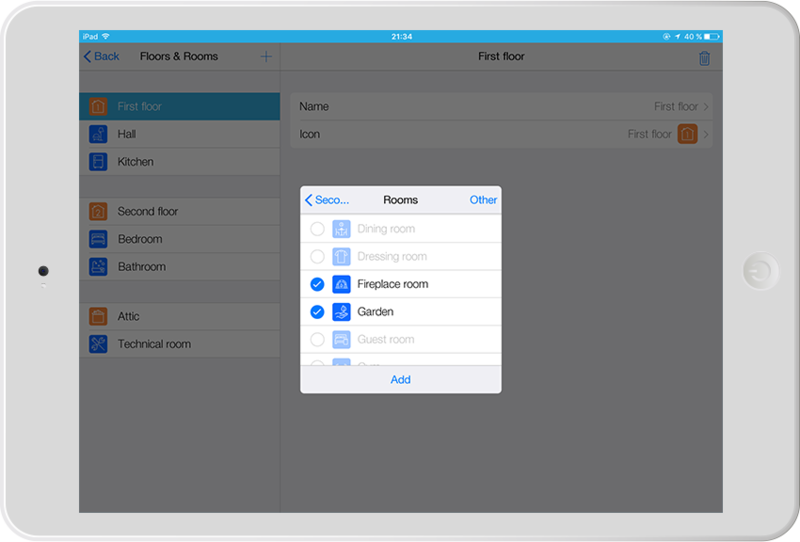 Rooms and floors can be added or deleted in the Floors and Rooms section. After setting rooms and floors we move to the most important section – Devices. Drivers/Modules of interaction with various services and “smart modules” that provide various functions are added here. 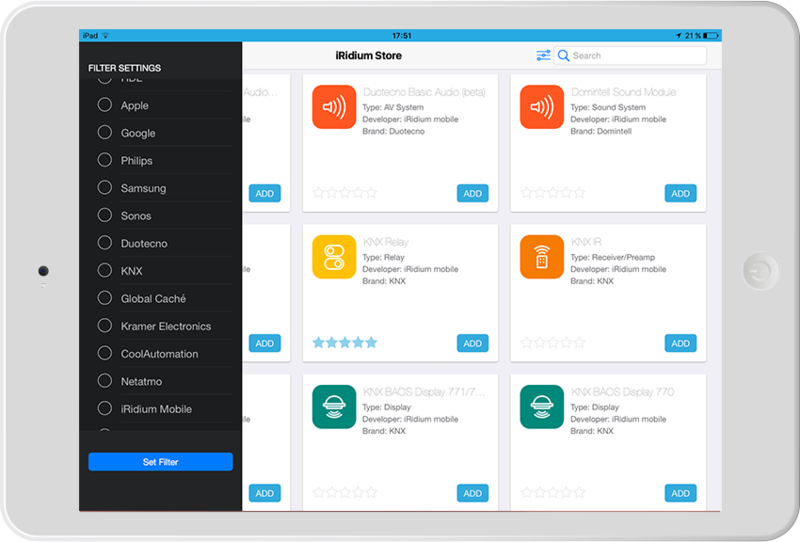 You can add a new module from the iRidium store or setup modules that you have already added. At the time of la unching the application, more than 100 modules are already available in the store, including very common systems for the automation market. After you add a module, it is downloaded to the device. In most case it requires configuration, authorization, or, at least, a choice of location of the device widgets. It is important to understand the term “subdevice”, which is used to describe the functional elements of a module. The authors of the application could not find a more suitable term, which collectively describes this entity. A subdevice is a part of a software module, designed to interact with some of its functions. For example, we have a 6-channel HDL dimmer. To control it, the HDL Dimmer module is used, automatically creating 6 identical subdevices, designed to control the channels. 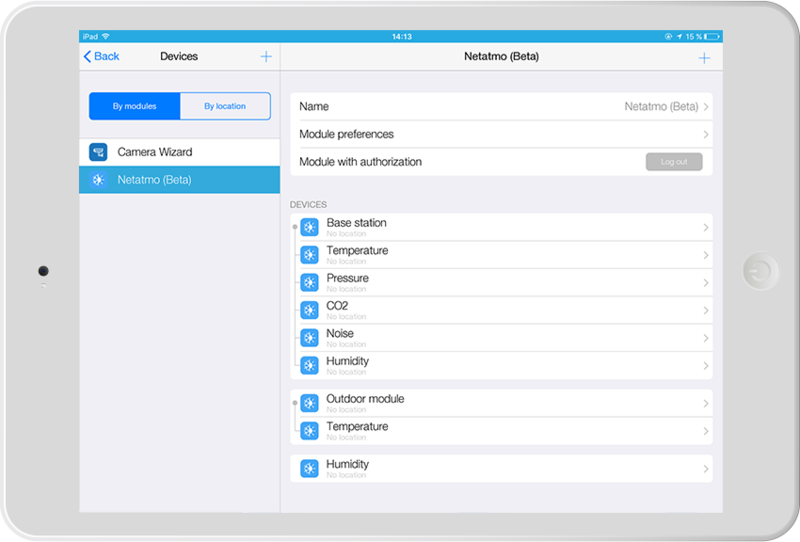 Another example is Netatmo weather station, which measures temperature, humidity, noise and CO2. 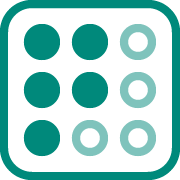 Each subdevice has its own widget, which can be located in the right areas of a graphic interface. Also, subdevices can be deactivated if they are not used. This is important, because the number of subdevices determines the cost of the license (the basic one includes up to 40). After adding and setting modules (you can see this process in this playlist on youtube), you can start customizing pages – adding images, titles, moving widgets. 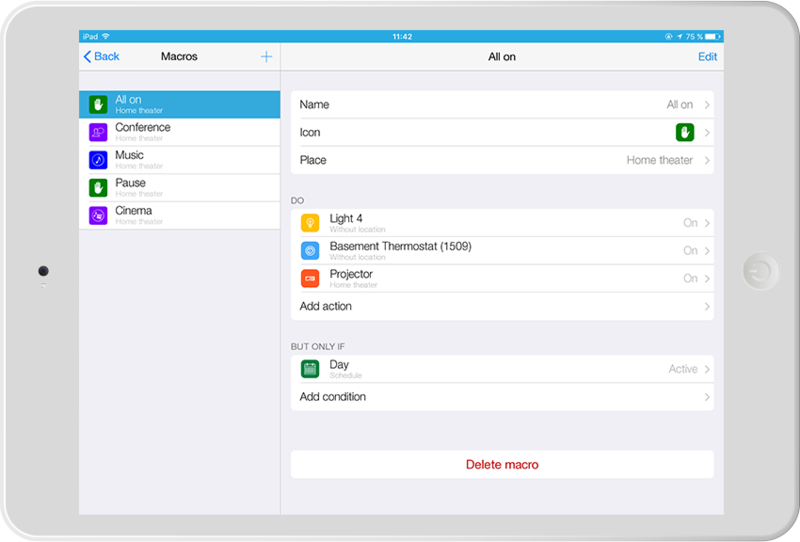 In i3 lite you can create macros actions. This is a set of commands for modules, which can be activated by a separate button or are used in schedules /routines. A separate place is provided for macros on the main page below the main image. The installer can allow or restrict an end-user to create their own macros in their project. When you create a project, you can attach a server to it. Almost any Windows device, Raspberry Pi or some other controllers by different manufacturers can work as iRidium server. Another iRidium lite capability is to create rules and schedules directly in the application. They work on the server or if there is no server – right on the panel. The installer can allow or restrict an end-user to create their own rules and schedules in their project. The schedule is the start time and the end time of an event (for example, “night” or “usual lunch”). Routines are the rules. Each module has actions, events and states available for logics. Example of a rule: IF the sensor on the first floor is in the movement state, then run the “turn on the light first floor” macro, the camera module takes a screenshot, the gmail module sends it to the owner’s mail, BUT ONLY IF the night schedule is active and night security mode is activated. 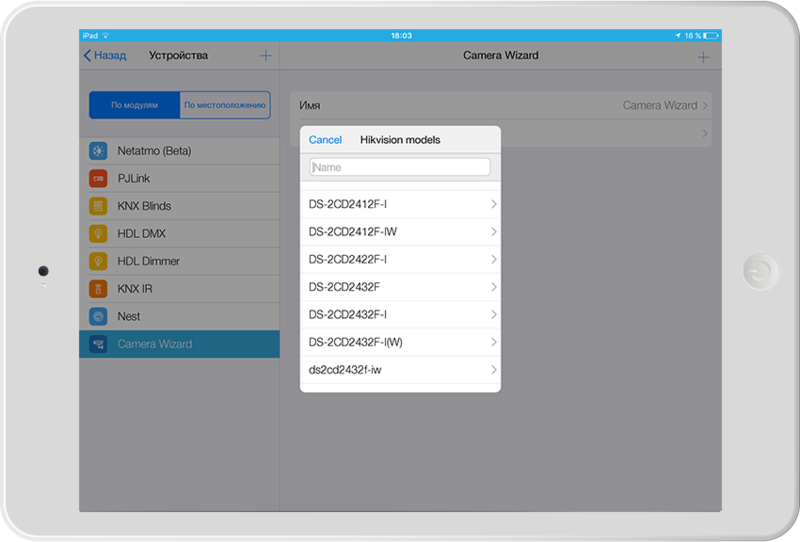 The camera module includes a database of common brands with settings. If the model is not available, you can insert a link to the video stream. Each camera is added as a separate subdevice. Full-screen mode is available to display on tablets. IF the leakage sensor is in the “Alarm” mode, then close the shut-off valve relay and send a “Warning, water leakage!” message to a definite address. iRidium currently produces two products that are created on the same platform, but are designed for different types of projects. 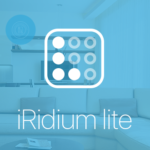 iRidium lite is designed for home/AV automation that does not require a unique GUI or free logics programming. But they require quick setup and can be flexibly changed in the hands of users. 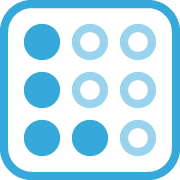 The number of users and control devices can also constantly change. iRidium pro is more suitable for projects that implement a unique vision of a certain integrator, a freehand GUI and free programming of automation. These projects suggest that once set the system works for many years precisely in the way the integrator made it.